In a world where God’s voice seems quiet, the noise of our smartphones gives us a shortcut. In the name of God, we use technology to connect with top religious thinkers of our day. Many of us subscribe to daily prophetic words or horoscopes that seem to give personal guidance. We can now be “friends” with well-known speakers and leaders in our spheres. Suddenly, like the tower of Babel, it seems we are all speaking the same language, building some great things, and achieving the impossible. We’re all on the same page, and it’s exhilarating and fun. What is really happening? In a manner of speaking, we smart humans are playing God. Once again, we are trying to manufacture things that God intends to come directly from Him, such as wisdom and love. Bluntly, this is the sin of idolatry. Our hunger for loving connection seems filled on Facebook. We satiate our need for wisdom by following trends and hashtags on Twitter. (In fact, #love and #wisdom are two of the more popular “trending” hashtags on Twitter.) Yet the picture God gives us in Deuteronomy is meant to be a picture of what our relationship with Him should look like: constant contact with our King. The downside is that despite all of our “following,” we wake up one morning, smartphone in hand, realizing that we no longer hear from God. We’re not following Him. Sure, we know what He’s talking about and can even regurgitate it – after all, we’re retweeting thoughts from the best religious leaders of all time. But the truth is, we aren’t hearing Him for ourselves anymore. We’ve lost contact with the trendsetter Himself by following all these others. This makes God sad. How do I know this? The same God who calls Himself Lord of Jews and Gentiles states in the Ten Commandments that “You shall have no other God before Me.” (Exodus 20:1). By His own admission, He is a jealous God. To the Christian, Jesus says a day is coming when people will say to Him, “Lord, Lord, have we not prophesied in Your Name, cast out demons in Your Name, and done many wonders in Your Name? And then I will declare to them, ‘I never knew you; depart from Me, you who practice lawlessness!’” (Matthew 7:21-23). * Statistics prove that 35% of Americans surveyed reach for their smartphones before anything else in the morning – even coffee! What do you reach for first, your phone or the Words of God? * 55% of men and 37% of women use smartphones while eating. Worse, nearly half of all men check their phones mid-conversation (49%; for women it’s 32%). 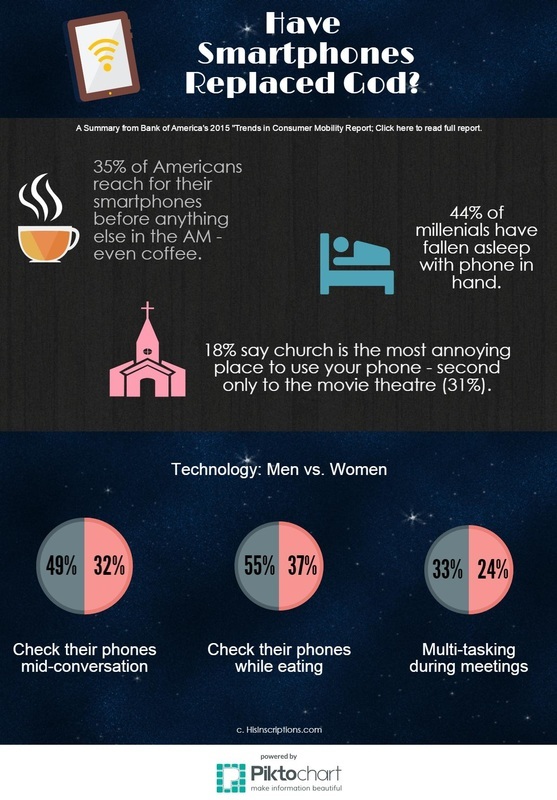 We’re not angels in church either: smartphone usage during religious services is one of the top two pet peeves for survey responders, second only to movie theatre interruptions. When we become too immersed in the things of this world, our spiritual eyes and ears are restrained. Like the disciples on the Emmaus road, all our reasoning and conversations cause us to miss the visitation of the Lord. In Luke’s gospel, when the disciples walked with Jesus after the resurrection, “they did not know Him.” (Luke 24:16; see especially the context in verses 13-31). This, after following Him for three years! If communication, love, and wisdom are that important to us, why do we neglect the God who is the source of all three? For Judeo-Christian believers (which represent over 70% of our American population), the challenge is going to be to put down our simulated intelligence and return to the true source of wisdom. Believe it or not, we don’t miss anything when we spend time with God. Those who seek God first automatically become the trendsetters, because He reveals in prayer today what will be “trending” tomorrow. (See Amos 3:7). When you tap into God’s love and wisdom before picking up your phone, you find out later that others are confirming what He has already told you. You become an insider and thought leader in your own right. Best of all, you know that you know Him and He knows you. You’re doing, not just hearing. You’re living a life of faith that others will want to follow. *Bank of America 2015 "Trends in Consumer Mobility Report"
Ignite a Revival Through Technology!